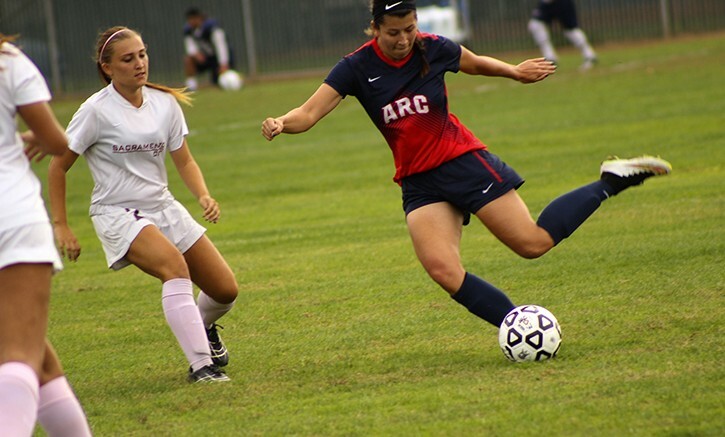 American River College’s midfielder Natalie Silcox was the star of ARC’s 3-0 win over Sacramento City College scoring two of ARC’s three goals. ARC’s first goal came in the first half by midfielder Natalie Silcox, a shot that just missed the fingertips of the SCC goalkeeper. Silcox ended up with two goals for the game and her aggressive play was instrumental in ARC’s win. ARC started off the first half slow but started off their attack later on and were unstoppable once they got on a role. Forward Brittney Neumann scored another goal for ARC in the second half on a pretty assist from forward Silvia Garcia. Garcia assisted on two of the three ARC scores. ARC head coach Paul Arellanes wasn’t particularly impressed by his team’s performance but was happy with the win. “We didn’t play well but we won.” said Arellanes. “It took us way too long to get the three goals but at the end of the day a win’s a win.” “In this conference any win is a tough one.” said Arellanes. Silcox scored her second goal near the end of the game as she raced past SCC defenders which left the goalie at her mercy. Defenseman Riley Affonso is optimistic about the rest of the team’s season. “We did okay but we came out looking for a win and we got what we wanted so now we are excited about starting the second half of our conference.” said Affonso. ARC’s next game will have its next game versus San Joaquin Delta College at ARC on Oct. 27, 2015. Be the first to comment on "ARC shuts down Sacramento City College with a 3-0 win"